This issue keeps to a more straightforward linear narrative as the story line focuses on Wonder Woman and her efforts to thwart Dr. Psycho. George Perez certainly creates a loathsome villain of pure evil and really cranks up the nastiness of Psycho’s perverted schemes. The very opposite in fact of everything that Diana stands for..
As the sun rises over the forests of New Hampshire a kneeling Wonder Woman screams, fearing she is going mad! A few moments ago she had been certain that she had been in the skies above Boston, battling with a deranged Hermes! She slams her fist down on the ground, smashing a stone in frustration. She had been in Boston she is certain! “I could smell it, feel it! It had to be real! It couldn’t have been just another accursed dream!” she asks herself. She hears a voice say that he knows how she feels and she lifts her head to see Hermes emerge from the trees. He tells her that he has been asking himself those very same questions for the past several nights. He had at first believed it was just some cruel prank being played by Morpheus, but now he realises it was something entirely different – an odious force that may require their combined strength to defeat. He sees the doubt in her eyes and begs her to believe that it is really him this time, just as he too must believe that this is the real Wonder Woman before him. For the sake of sanity they must trust each other. Wonder Woman ponders his request and says that he had told her the very same thing earlier, so why should she believe him now? What if this is still part of her dementia? In fact, how does she even know she is not still facing the God over Boston…or lying in her bed on Themyscira…or back with Lady Harmonia in Areopagus? The Goddess had made the same claims as Hermes does now, so how can the Amazon Princess be sure of anything anymore? Hermes places his hand reassuringly on her shoulder and says that her all powerful, indestructible faith will show her the way forward. That same stubborn faith he senses in her now also assures him that she is truly Diana. Their nightmare is over for now and what a nightmare it had been! He then tells her that only in a mad dream could she have ever advocated him destroying Boston. Wonder Woman places her hand on her forehead feeling that her tiara is missing and in frustration, accuses him of trying to confuse her again. She reminds him that he had mocked her for her faith and it was he who had been trying to destroy the city! She had tried to stop him by throwing her razor edged tiara at him. Hermes then holds out his Caduceus and shows her tiara hanging from it. He tells her that he does not know what monstrous ravings his dream self had spouted at her, but he is grateful that her rage was enough to cloud her aim! He again asks her to study his eyes as he has done hers, so she can see that the Hermes she had encountered in her mind is not the Hermes who faces her now – just as she is not the Diana he had faced over a non existent Boston. She does not reply and he then suggests that if she cannot trust her eyes then perhaps she should use her lasso. She unhooks the glowing rope from her belt and unfurls it but pauses, before clutching it to her chest and sinking to her knees once more. “No” she says meekly. Hermes asks her one more time to have faith and believe. Meanwhile at the home of Dr. Charles Stanton, the villain known as Dr. Psycho sits on the bed holding a photograph of Helen Anderson and Stanton from their college years. He speaks into a dictaphone, providing a progress report for his own records. He says that on Day 23, he has experienced a minor set back although he should have no trouble “re-accessing the Psycho-Structure”. It would seem that not every link in the chain was as well coupled as he had perceived. Even as he had sensed his “masterpiece” nearing completion, with the fight between Hermes and Wonder Woman reaching its deadly climax and the last brick of the psycho-structure about to be laid, the meddling Helen Anderson had found a “back door” where he had thought none existed! He had been so close to triumph but her trespass at the vital moment had ruined it for him. As a result he had immediately reached into her mind to make her pay! After weeks of meticulous detailed work, accessing Helen’s psyche was pathetically simple. Still, perhaps there is more to all this than he has recognised…some reason why Helen was not taken in by his psychic ruse…something he had not accounted for? As he peers down at the motionless body of the heavily pregnant woman he suddenly realises what it is. An extra mind! One he could not manipulate by standard means! Her unborn baby! He smiles gleefully and congratulates himself for not having killed her straight away. There may yet be a great opportunity in this setback! As he caresses her belly he muses how he has created many masterpieces from without – but never from within. Never upon such an unmarked canvas! He chortles how his new masterpiece will be beautiful…”Madonna and Child” by Dr. Psycho…a portrait of a mother, maddened to death by the dreams of her unborn! Back in Boston at the Kapatelis family home, Hermes has transported himself and Wonder Woman to Vanessa’s bedroom. Surrounded by a Godly nimbus that hides their presence from the sleeping girl, the uneasy Amazon Princess tells Hermes that she does not feel right about being here. The God understands how she feels but adds that they have no other choice. These hauntings they have jointly experienced appear to be linked with the young girl in some way. Wonder Woman is unsure and reminds him how she has not spoken to Vanessa for a long time now – since right before the dreams started in fact, when suddenly all whom she had known and loved turned their backs on the Amazon. Even Hermes. The God then asks her why she had not found this unusual? She had attributed it all to coincidence – to fate – but he knows the Fates well and this is not their handiwork! He tells her that they had been fortunate the last time, but that they may not be able to count on such good fortune again. They must “track the beast to his lair and attack him while he slumbers”. His instincts tell him that Vanessa is their only hope of achieving this. But Wonder Woman turns away and refuses, saying that Julia had been right about her and that she will not cause this girl any more pain! She demands they find another way. Hermes however simply replies that in that case he will do it himself . Their foe had stripped away at his dignity and he has endured that for far too long. It must end tonight. As he advances on the sleeping Vanessa Wonder Woman holds him back and she growls that his Olympian ego will not be the cause for anymore suffering! “I forbid you!” she snaps. The stand off lasts only for a few moments as they stare at each other, before Wonder Woman slowly releases her grip and turns away, bringing her emotions back in check. The God laments how they face each other in anger yet again. Just like in their dreams. Wonder Woman nods, sighing that even when they are awake their foe’s poison eats away at their souls. Hermes points down at the sleeping Vanessa and remarks how peaceful she looks. Just days ago she had been haunted by nightmares too. “Yes, because of me!” Wonder Woman reminds him. Hermes smiles on hearing this and replies that her ego surpasses even his! How else could she believe that every evil owes its existence to her? What if Vanessa’s violent dreams were also the manipulations of this same foe? He then pleads with the Amazon Princess that they must do what must be done…for Vanessa’s sake as well as their own. Meanwhile Helen Anderson suffers horrific nightmares at the hands of Dr. Psycho as he makes her see visions of her unborn child in her womb. Helen is forced to see the baby’s viewpoint, with swirls of red blood surrounding the child as it screams that it wants to escape. Monsters then emerge from the crimson swirls and the terrified baby tries to keep them at bay, all the while screaming for Helen to save it! Back at the Kapatelis Residence Julia wakes with a start and is sure she has heard her daughter cry out. She decides to check on Vanessa and as she walks onto the landing she notices a light emanating from the child’s bedroom. Opening the door she is shocked to see Vanessa apparently writhing within the coils of the golden lasso which in turn is being held tightly by Wonder Woman! Julia believes the Amazon is killing Vanessa! Her daughter calmly reassures her mother that she is fine and that she has given Diana her permission but the Professor is having none of it. She screams at Wonder Woman to get out of the house, saying that Diana has already caused her daughter enough pain as it is. 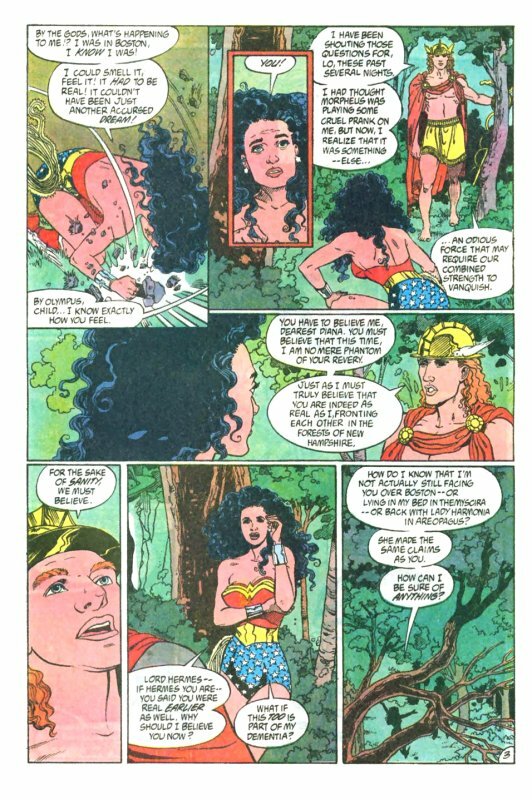 Hermes, who is still hidden by the mystic nimbus, tells Wonder Woman that it appears Julia is still under the delusory spell and offers to intervene, but Wonder Woman declines his offer. As Julia tries to desperately remove the lasso she hears Diana speak to the Messenger God and demands he shows himself. Hermes obliges and Julia snarls that he is still obviously trying to purchase adoration with his “hocus pocus”. Hermes warns her that although he realises her perceptions are currently being skewed there are limits to his tolerance. Julia turns her attention back to Vanessa and reassures her that she will be free in a moment, but the bemused young girl tells her mother to “Chill out!”. She shows Julia that the lasso is simply lying loose around her and she has okayed it all with Diana. “Apparently someone has been messing with all our heads.” A confused Julia momentarily regains her senses and asks who is doing this to them? 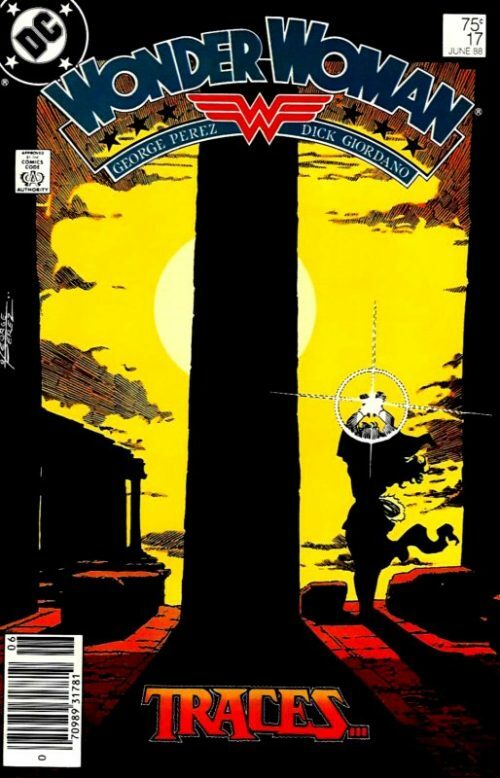 Wonder Woman replies that it is a demon who hides in the shadows and must be drawn out into the purifying light. Wonder Woman tugs on the lasso once more and many miles away at Charles Stanton’s house Dr. Psycho again feels like a hand is clutching towards him. It feels just like the moment before he had lost control of Wonder Woman and Hermes, when Helen had intruded. He realises to his horror that someone is trying to break into his mind and he fights back hard, yelling that no one defiles his work! Vanessa suddenly recoils as they all hear Psycho’s voice boom “No one!” Hermes tells Wonder Woman that she has succeeded in connecting with their foe and urges her to hold onto the lasso tightly before he can escape again. Julia sees a writhing Vanessa though and cries out that they are killing her daughter. Through her eyes she sees demonic versions of Wonder Woman and Hermes cruelly enjoying Vanessa’s agony. The Amazon Princess tries to reason with Julia’s clouded consciousness, pleading with her not to trust her eyes and assuring her that she would never do anything to harm Vanessa. For her part, the puzzled young girl reassures her mother that she is fine. But Psycho’s hold over Julia is strong and the professor rants at Diana, asking why she had come back? Everything had been fine and Vanessa had been happy again before the Amazon had returned. A hurt Wonder Woman begs her to listen but Julia lunges for her, swearing that she will stop Diana hurting her daughter again! 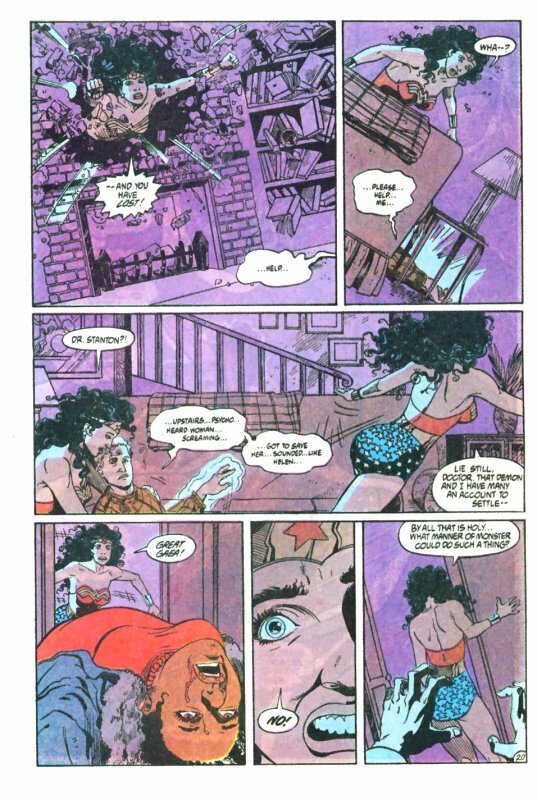 However, before she reaches the startled Wonder Woman, Hermes uses his powers to place Julia in a stasis field. Vanessa again asks her mother to snap out of her delusion and leave Diana alone or else she will ruin everything. She tries to explain again how they have all been living out someone else’s lies! However, Dr. Psycho decides to try a different tack and turns Julia’s venom on Hermes instead. She asks why the God had not killed himself when he had had the chance. At least that would have been an honest act…an admission that all of his Olympian kind are nothing but bloodless superstitions born of desperate feeble minds…as inconsequential and impotent as dust! A furious Hermes raises his Caduceus in anger and advances on Julia but Wonder Woman assures him that whatever he had just heard from Julia’s lips had all been in his mind. She pleads with him not to succumb to the delusions again because she does not know how long she can fend off their foe’s power alone. She begs him to listen to the words of one who loves him – and who has never lied to him. They must conquer this evil together. Hermes sees the truth of her words and raising his staff, summons his godly powers, intent on defeating their opponent once and for all. 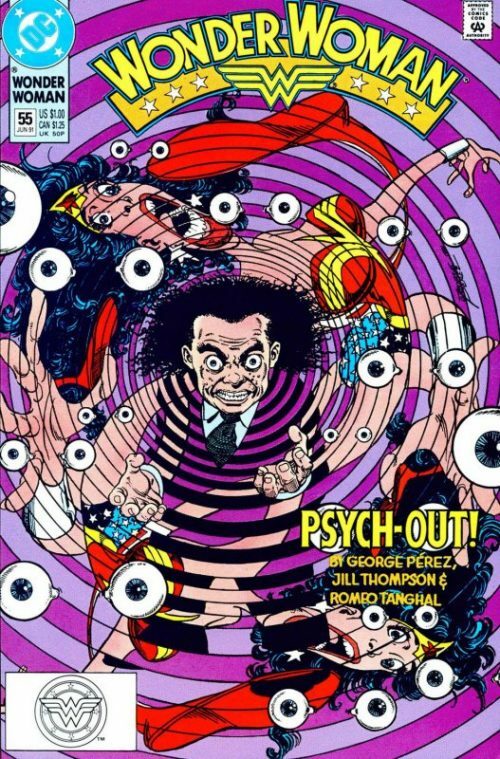 The power of his Caduceus encircles and protects them from Dr. Psycho’s onslaught, but he asks Diana to act quickly as he is already straining to keep the shield in place. Wonder Woman turns back to Vanessa and looks into her eyes questioningly. The young girl says that she is not afraid of what will come next and as Diana places her hands reassuringly on Vanessa’s shoulders, she replies “I know how brave you are sweet Nessie.” She then prays to herself that she is doing the right thing for the girl. Julia had been right when she had said that Vanessa had been so happy of late. For the young girl at least, Psycho’s curse has been a sort of blessing. Wonder Woman then asks Vanessa to remain still as the power of the magic lasso surges from the Amazon Princess into the girl. She asks Vanessa to relax so she can share her mind. “Let the truth burst free so that it may in turn free us all and let the lies of the demon-mind burn to ashes upon Hestia’s pyre!”. Miles away, Dr. Psycho suddenly screams in pain and clutches his head as Wonder Woman enters Vanessa’s mind. Surrounded by many images from the girl’s fourteen year life, she feels like an intruder and wishes there had been some other way. She drifts through scenes of past life experiences but soon they turn into horrific images as she sees the nightmares that Psycho has implanted in the girl’s head. Wonder Woman asks for Vanessa’s forgiveness in making her relive these ghastly visions as she had never realised how truly frightening for the girl they had been. She then hears a voice saying how there would be no hope of recovery while Wonder Woman is around and the Amazon recognises it as belonging to Dr. Stanton. However, he was talking to Julia alone when he had said that. How could Vanessa possibly remember something she had never experienced? 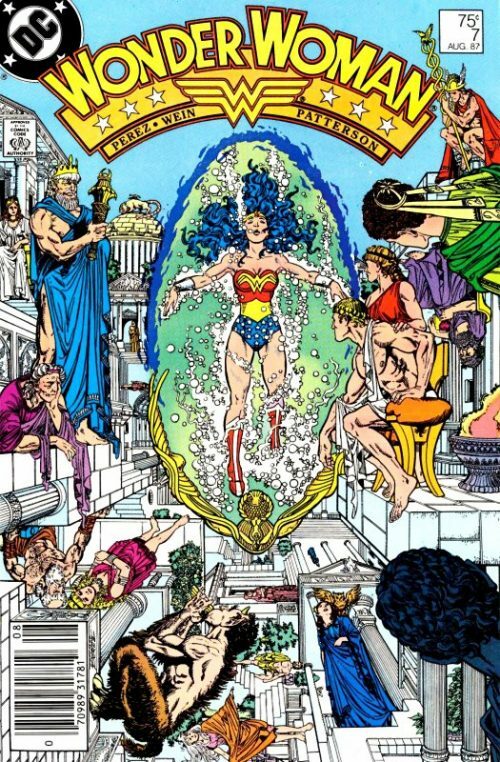 As Wonder Woman continues to drift past the swirling imagery of negativity she is bombarded with other voices; Steve, her mother, Hermes, all full of resentment and hatred towards her . She covers her ears, blocking them out, determined that she will not succumb again! A black tunnel suddenly swirls into view and at its end she can see the sneering face of Dr. Psycho. She hears Vanessa ask why she has never seen this face before in her dreams and Wonder Woman explains that if she had, she would have seen the truth, because it is the key to all this madness. She then hurtles towards the face, thanking Vanessa for her help and murmuring “The game is over Dr. Psycho!”. Wonder Woman bursts through back to reality and smashes out through a brick wall into the living room of Charles Stanton’s house! She hears a meek cry for help and sees Dr. Stanton lying on the floor. She helps him to sit up and he weakly points upstairs, saying how Psycho was up there and that he had heard a women who sounded like Helen Anderson, screaming. Wonder Woman tells him to rest as she rushes up the stairs towards the bedroom. As she bursts in she sees the counselor lying motionless on the bed, Helen’s terrified eyes staring into space while blood drips from her open mouth. Wonder Woman sags in horror at the sight while unknown to her, Dr. Stanton has silently crept up the stairs and approaches her with his hands outstretched! As the Amazon Princess takes in the magnitude of what has happened to Helen, Stanton moves to grab Wonder Woman, his eyes mesmeric. At the last moment however Wonder Woman suddenly cries out “Damn you!” and lashes out with her fist, sending Stanton hurtling backwards. He slams into the wall and as he crumples unconscious to the floor he transforms back into Dr. Psycho! Wonder Woman muses to herself that the nightmare is over for now. Psycho’s last desperate deception had been his undoing. He should have simply turned tail and fled because once discovered, even hecould not prevail against the lasso of truth. 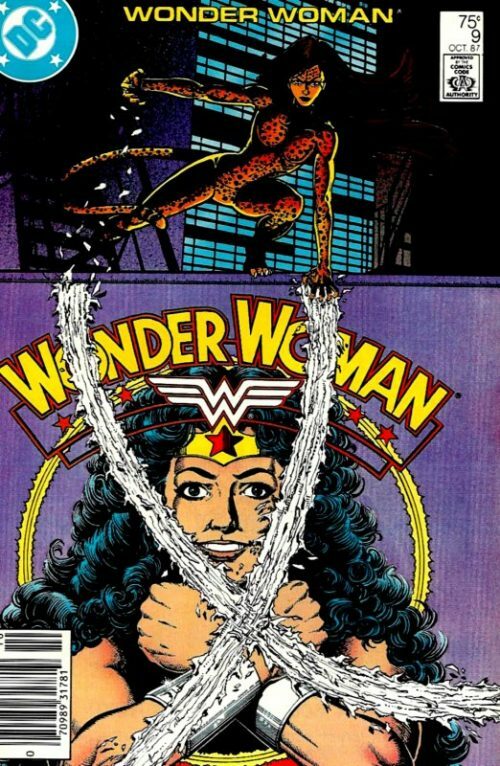 Wonder Woman then removes her belt to reveal that the glowing rope had been secretly wound around her waist! The Amazon Princess sways and collapses to her knees as her haggard soul finds no comfort in her triumph. She bows her head in grief beside the body of Helen, an innocent casualty of this war, asking herself one simple question. Why?